Today is August 25th, the start of Autumn 2011 and my second blog entry. Here’s an idea. Each first day of a season, I’ll write about how this time of year affects my artist’s sensibilities – sight, sound, smell,taste, touch or could be the 6th sense. My (almost) daily walks around White Rock Lake – a gem tucked into nature-bursting neighborhoods not far from Dallas’s Central Business District and down the street from where I have my home and studio – are a time to slow down and find quietness. Mine is not a sweaty workout. Rather, it is a time to soak in anything that spontaneously catches my interest. 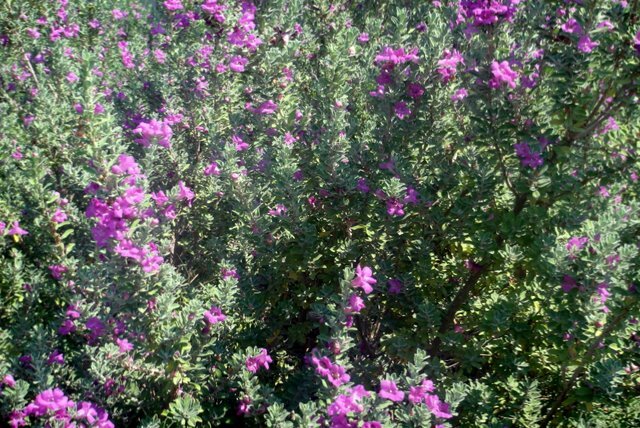 A cluster of Texas Sage shrubs has greeted me on my lake walks throughout this year’s 100+ F summer. 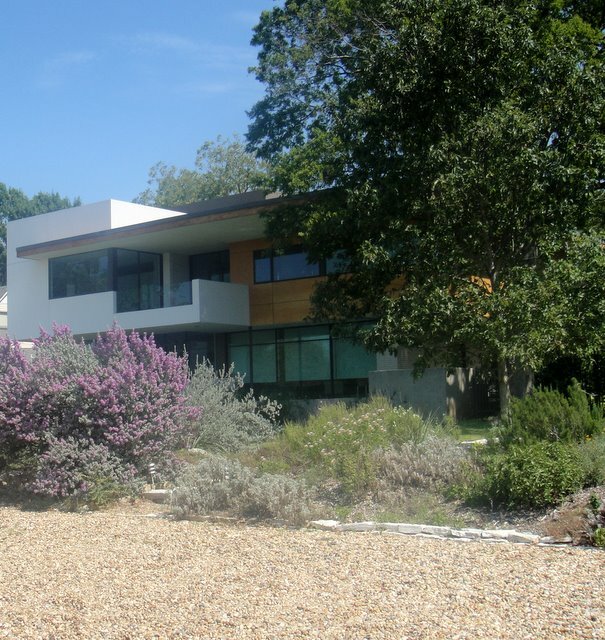 In the past weeks, I’ve noticed that the sunlight has a new angle and casts different shapes and length of shadows from the sage and the contemporary home. Nature’s colors are now showcasing softer purples and greens – subdued violets and sage greens. With autumn officially here, the shrub has sprouted its purple heads, nodding towards the lake, readying itself for winter, and making me ready for another upcoming change and season. Welcome to my blog, a place where I can and will talk about anything that interests and inspires me as a person, artist and friend. Here it goes with my first post…. I like to draw. I like to paint – always have and always will. long horizontal band of beautiful colors. I loved it. I can still see it in my mind’s eye. Those naps were some of my best rests; and the best of all, Mom pretended nothing had happened. The painting on this Home Page, “Finding Malcolm Gladwell,” reminds me of this childhood time. From 15 layers of textured and dripped colors, the underpainting’s spaces began to suggest that I had to draw something. That something became fine-lined men’s faces and body parts. There is Winston Churchill, Malcolm Gladwell and others, sometimes a handsome and interesting anonymous man’s face. 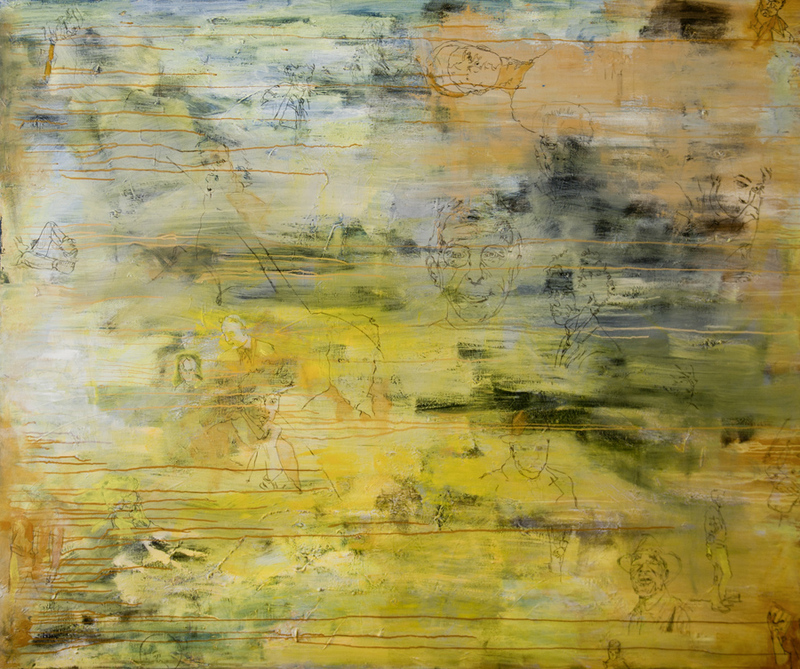 This painting inspired a body of work called Emergent Series. Finding Johnny Depp was the next one I finished, and now hangs in the home of Dallas collectors of contemporary art. The series continues…I’ll post more as they are completed.